Sacred Heart Parish is the oldest, continuous parish founded and staffed by the Congregation of Holy Cross. The parish was started together with the University of Notre Dame in late November of 1842 by Holy Cross priests and brothers, led by the Reverend Edward Sorin, C.S.C. French missionaries had already worked among the indigenous peoples of the Michiana area, including Father Jacques Marquette, S.J., (d.1675), and Father Claude Allouez, S.J., who in 1687, founded the Saint Joseph’s Mission near present day Niles, Michigan. The Jesuits departed in 1773, and pastoral activity among the indigenous peoples and white settlers was suspended. A more permanent solution for pastoral care in Michiana came about when the new Bishop of Vincennes, Bishop Hailandiere, offered the land purchased by Father Badin to Father Edward Sorin, C.S.C., for the expressed purpose of starting a college in north central Indiana. On December 25, 1842, Father Sorin celebrated his first baptism in the primitive “Log Chapel” built by Father Badin along the shores of Saint Mary’s Lake. Sorin renamed the new mission “Notre Dame du Lac”, Our Lady of the Lake. Father Sorin, six Holy Cross brothers, and local townspeople began to build a small log cabin church and a two story dwelling for the students which we now know as “Old College” in 1843. A larger church was completed in 1848 and named after the Sacred Heart of Jesus. In 1871, this second church was replaced by a much larger Prairie Gothic structure which remains to this day. In 1992, Blessed Pope John Paul II elevated Sacred Heart Church to a Minor Basilica. Over the years the boundaries of Sacred Heart Parish have diminished to allow the formation of new parishes in the South Bend area, including: Saint Joseph Parish in 1853; Saint Patrick Parish in 1858; Christ the King Parish in 1933; Little Flower Parish in 1937. In the three decades after the Second Vatican Council (1962 – 1965), Sacred Heart Parish rolls swelled with parishioners not connected to the University of Notre Dame and others living outside the actual boundaries of the parish. In recent years, however, Catholics have gravitated to the larger parishes, especially those with elementary schools. Today, Sacred Heart Parish is more modest in size and ministers to those families who have a connection with the University community and the Basilica. Finding room for Parish meetings and social space on campus has always been a challenge. A solution came about in 1995. The pastor at that time, Father Jose Martelli, C.S.C., negotiated with the U.S. Province of Holy Cross Priests and Brothers, to rent the “old” Moreau Seminary on Saint Joseph’s Lake for Parish religious education and adult faith formation; and parish social space for lunches, dinners and receptions. Now called the “Sacred Heart Parish Center”, the facility also offers opportunities to local parishes and high schools for overnight retreats and missions. The Basilica (“upstairs” church) is the “University” church. 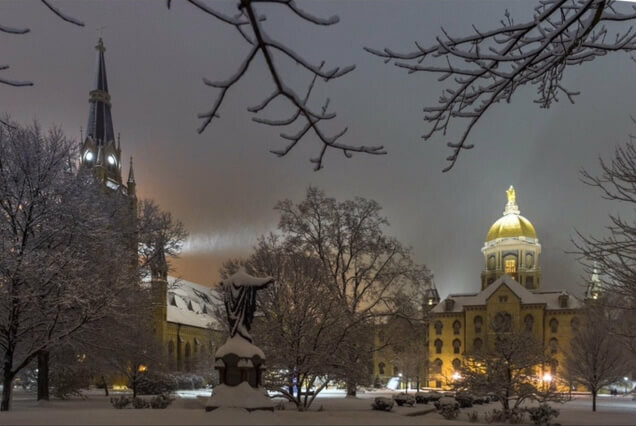 The Basilica serves the faculty, students, and alumni of the University of Notre Dame. The Sacred Heart Parish community gathers for prayer and worship in the Crypt, which is located in the basement or "garden level" of the Basilica, directly beneath the Lady Chapel. Enter the Crypt church using the outside doors at the north end of the Basilica. The pastoral work begun centuries ago by French missionaries in the Michiana area continues at Sacred Heart Parish through the ministry of Holy Cross priests, Holy Cross brothers, and dedicated parishioners who share their time, talent, and treasure. May God, who has begun this good work in us, bring it to completion.